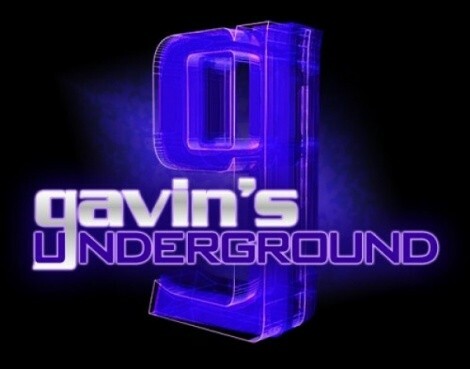 In The Loop: 4/21/12. Happy Record Store Day! Hello to tall you album-buying, band-watching, merch-snagging, collectibles-rummaging, vinyl-snobbing, headphone-holding, picking-up-what-you-can-at-Record-Store-Day enthusiasts! --- I decided to skip Record Store Day this year for two reasons. First, the store I always covered was Slowtrain -- not because it was convenient and not because of the lineup, but because I liked the shop and felt it had some of the best representation of the day. With it now gone, this year felt a little empty. And second, everyone else is already doing their own thing for it, including City Weekly, so throwing more coverage on top of over-coverage after it happened would have looked like overkill this year. I'll probably hit it up next year, but for the time being, enjoy today's events at all your favorite shops across the state! In lieu of a 337 Wall update (seriously?!? ), here's some random art from the streets of downtown SLC. We're going to go straight into events this week, starting with one happening tonight over at Bar Deluxe. 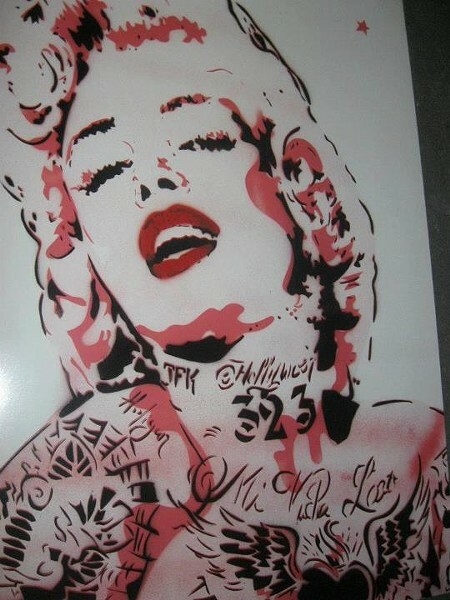 The aptly named Art Deluxe will feature street art for sale by Ivie Stencils and Original Hooligan. From 5-10 p.m. you'll have a chance to pick up some cheaply priced, unique works from two of SLC's experienced stencil artists, followed immediately by a show featuring Roots Rawka Presents Myka 9, Aera One, Jae The Sarge, Zoo Effort and DJ Itchie Fingaz. Here's a sample of some of the work you'll find there today. Speaking of artwork, this Tuesday at The Metro, the next installment of SLC Dr. Sketchy's Anti-Art School will be holding their next drawing night. This month, you'll want to throw on your communicator and finest red tunic as the ladies on display will be going with the theme of “Spacegirl Adventures.” We real geeks can only hope for Orion Slave Girls (go look it up). Get out your finest anti-gravity pads and pens and sketch away! 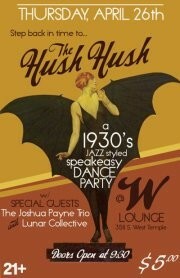 This Thursday, the W Lounge will head back a number of decades to the 1930s for The Hush Hush. The party will take on the theme of a jazz-styled speakeasy dance, featuring The Joshua Payne Orchestra and Lunar Collective. Those attending are being encouraged to dress in the period, and knowing the venue, there most likely will be special drinks for the occasion. Go check it out. 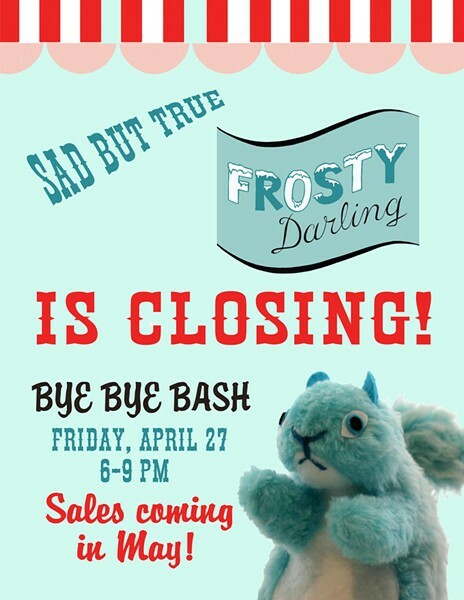 A few weeks ago, we learned of the unfortunate closing of Frosty Darling, which, for those of us into the kitsch and odd art, will leave a very big hole in the cityscape. But the store isn't going away without giving you a chance to clear out the inventory! Your first of the last big parties will take place this Friday from 6-9 p.m. as it has the Bye Bye Bash. I can't stress this enough: GO OVER AND BUY SOMETHING BEFORE IT ALL GOES AWAY! Next Saturday will kick off the two-day festival known as Earth Jam. 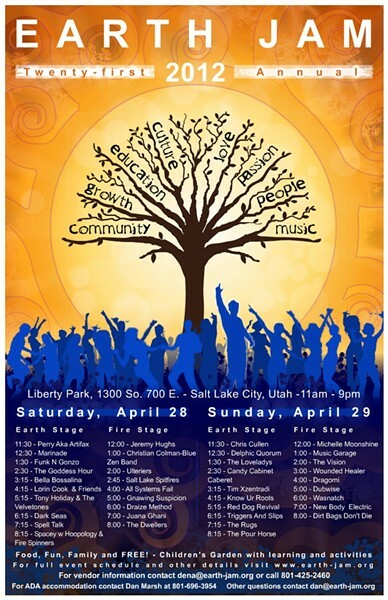 This year, the festival celebrates its 21st anniversary in style at Liberty Park, with two stages and over 40 bands, not to mention tons of activities and guides to help you learn how to help save the environment and help the community out in various ways. And the best part is the festival is completely free to attend. 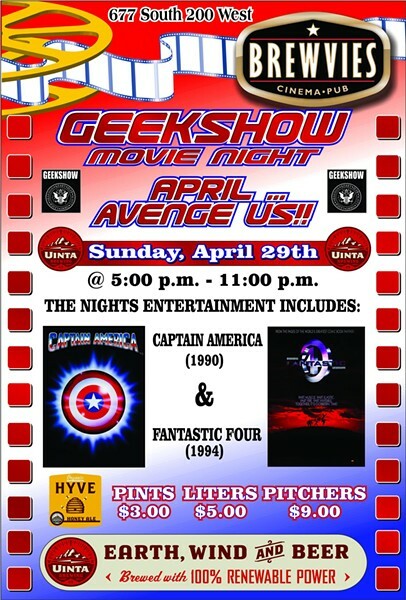 Next Sunday will be the next installment of the Geek Show Movie Night over at Brewvies. The award-winning podcast will be doing its best to get you excited for The Avengers coming out in just a few weeks with a couple of Marvel Comics' ... well, not so great films: the original Captain America movie from 1990 and the original Fantastic Four film from 1994. The whole evening (sans the food and beverages) is free for all! Come enjoy the worst Marvel and '90s movies had to offer before seeing the best this summer. Skipping a bit to May 4, the Pierpont Artists Company takes over The Hotel and Club Elevate for the 4th Annual Utah Beat Society. Nine of Utah's finest and freshest names will take over the room for a live beat competition: Brisk, Finale, Fisch, Linus Stubbs, Melvin Junko, Planit, Sayo, Yoga Flame Kane and Vivedend. 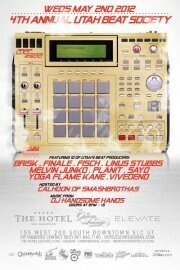 The night will be hosted by Calhoon from The Smash Brothas, with DJ Handsome Hands. Go check it out and vote for your favorite! 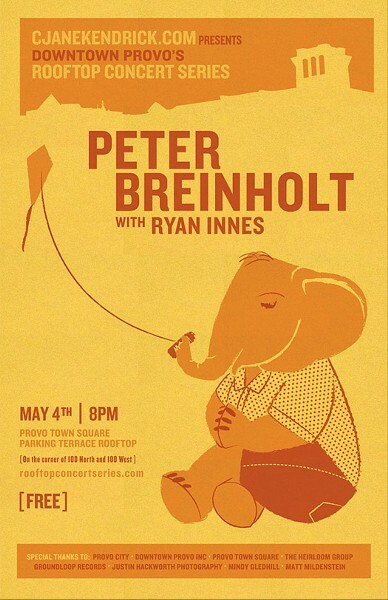 Meanwhile, down in Provo that night will also be the return of the Rooftop Concert Series! The concerts were a major success last year with packed shows; so packed, in fact, that some attendees couldn't get in and had to seek out a viewing spot from one of the surrounding buildings. Two bands a month will take over the Provo Town Square parking terrace for a free concert over the next six months. Head on down to check out this year's opening show. 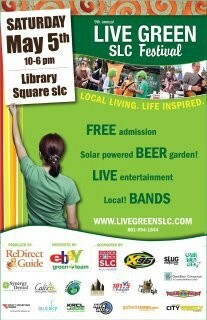 Two weeks from today, the Live Green SLC Festival will be held at the SLC Main Library. If you didn't quite get the premise from the title, it's essentially a local-support festival that showcases environmentally friendly ways to live. There are a lot more details behind that, which you can read up on at its website, but take my advice and go check it out because any description I give can't do it justice, like the below-mentioned Solar-Powered Beer Garden. 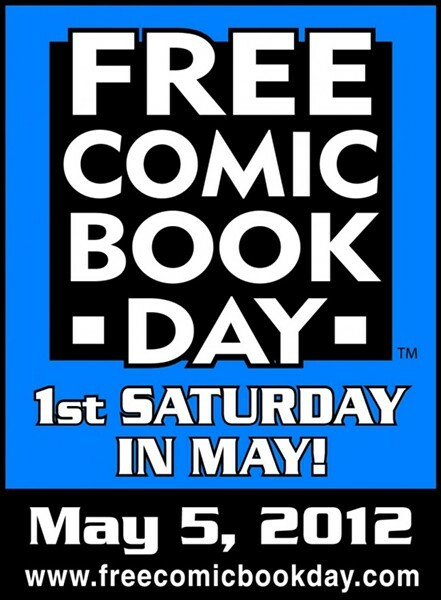 And finally, that day will also be Free Comic Book Day. We'll have more details on this a few days before the event, but basically, it's a chance to go get free comics from many of your local shops around the city and state, and many of the shops in town will be doing a lot of extra things to celebrate. Keep your eye on CityWeekly.net in the next few weeks for details. As for the blog -- we'll have a little something of everything as we check out this month's Gallery Stroll, have a concert recap, look at an online radio station, see the last shows of the season for a theater company and a dance company and take a look at a new community-outreach group. At least, that's the plan right now. Who knows what will take place? As always, we'll see what happens.